Morgan James Publishing, 9781614487852, 350pp. Learn HOW in the updated, 2nd edition of The Insider's Guide to Becoming a Yacht Stewardess and be working aboard a luxury yacht in no time This book is dedicated to making your journey as easy and hassle-free as possible. . .
Let seasoned travel professional Julie Perry be your guide to the private domain where royalty, celebrities, and billionaires vacation. Since 2006, The Insiders' Guide to Becoming a Yacht Stewardess has been a must-read guide for hopeful, young travelers and those intrigued by a career path in the superyacht industry. 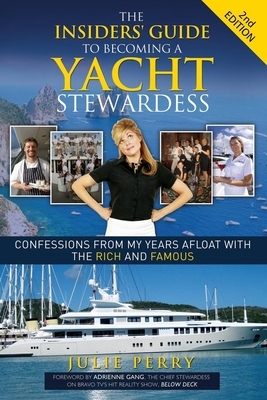 Based on her own work experience and interviews with dozens of yachting industry experts and recruiters, the updated version of this clever and entertaining career guide delivers all the exclusive advice and practical guidance you need to get started---and succeed ---as a luxury yacht steward/ess. "Trust me, if a non-bed-making, non-laundry-doing, hardly-ever-cleaned-her-room-during-adolescence, scatterbrain from landlocked Indiana can do it, anyone can " - Julie Perry, Author. Julie Perry spent three years as a megayacht stewardess, which took her to over 40 different ports in 18 countries. And she can tell you how to do it too. The first edition of her book, The Insiders' Guide to Becoming a Yacht Stewardess, has been a must-read guide for yacht crew since 2006. With the release of her updated, second edition, Julie hopes to continue to help wannabe "yachties" get into this awe-inspiring industry---if not simply entertain those intrigued by such a career path. Currently a digital-marketing executive living in landlocked Indiana, Julie stays connected to the yachting community by attending megayacht shows year-round and speaking at marine events. She doesn't miss cleaning toilets for the world's wealthiest, but she does miss traveling the high seas with them. . .Instead, she writes about it.